I had ventured into a fascinating area. Not far from the terrace wall, tall as an altar, I saw a large rock that seemed out of place as though it had fallen from on high. It was cracked in a number of places. I rested my elbows on it and examined it more closely. The sun was striking it at a thirty-degree angle. Engraved in the rock were two elongated lobes, one on each side, with a long mound like a giant toe between them. The whole thing was over a metre in length. At first I thought these shapes must have been made by water running down the rock over many years. But why would the water make circular grooves? I had once seen pictures of dinosaur footprints; the similarity here was striking. I lifted my eyes and tried to imagine an enormous animal standing with one foot over this rock, its head almost reaching the top of the hill overlooking Ramallah. How brief a moment is given to us to be here on earth. And how beautiful was that moment then with the hills all spread out before me, not submerged under water, not dominated by enormous animals, but full of wonderful treasures. From Palestinian Walks: Notes on a Vanishing Landscape by Raja Shehadeh. Let me start by speaking of my developing attitude towards the land and how my various interests came to be best expressed in a book about walks. I grew up in Ramallah, a village which has since grown larger and is now considered a city in West Bank terms. All the houses I have lived in there – from when I was a child until the present – have overlooked the hills. I have always looked at the hills and watched them change. But when I was growing up I was taught to despise them, because my family had been forced to move to Ramallah in 1948 from Jaffa, where my mother was born and my father had been a lawyer. They had lost everything, including the matrimonial home they had established in Jaffa. My grandmother, who was from Haifa, was also forced to leave her hometown for Ramallah. It must have been a very different environment. Yes, after having moved from a vibrant coastal city to an impoverished village – and not by choice – they felt enclosed and imprisoned. In the evenings when I was growing up we always looked towards the coast, which was lit up at night. On clear days you could see the sea and the ships. My grandmother would often look longingly at what she thought to be the lights of Jaffa, but which were actually those of Tel Aviv. There were very few people left in Jaffa and few lights. I grew up despising the hills and thinking there was nothing good in them, because all that was beautiful and worthwhile in life was over there – not here. I have written about my childhood in Strangers in the House. The only time we went to the hills was in springtime, when we would take a picnic. Sometimes we picnicked in A’yn Qenya. We never walked there in those days, although it was lovely. Instead, we drove and stayed for part of the day until my father, who wasn’t really interested in nature, got bored. Was the land around Ramallah farmed to any great extent? 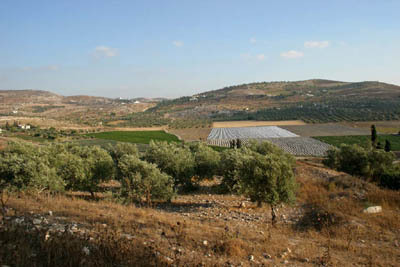 All of the hills around Ramallah had been terraced to prevent erosion and planted with olive trees. In the old days, they were also planted with figs and grapes (before the grapes were destroyed by disease). In spring and throughout summer, seasonal vegetables were grown without water, including the most amazingly delicious tomatoes and cucumbers. 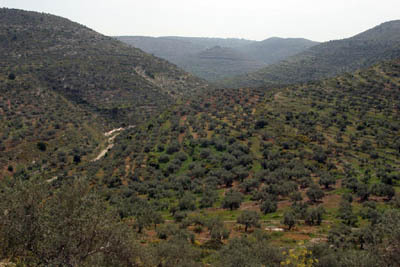 Most families in Ramallah had land with olive trees. Olive-picking is very laborious, requiring the efforts of the whole family and usually neighbours as well. 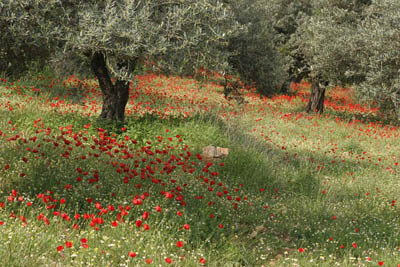 Families would go to the hills and spend a few days there during the olive-picking season, usually in October. Some would travel to their groves every day, if they weren’t too far away. The exception was our family; we didn’t have olive trees, my father never cared to acquire any, so although some people had memories of going to the hills to pick olives, I didn’t. 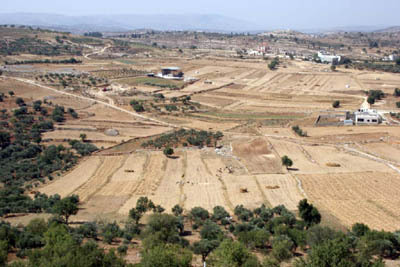 The possibility of surviving on agriculture wasn’t very good because of the lack of water – around Ramallah there were springs, but they were of limited capacity. People had been emigrating from the area since the nineteenth century. Some of my family, including my grandfathers, went to the United States in the early twentieth century to get an education, but all of them returned. And that meant that within your family there were both traditionalists and those who aspired to a different way of life. My grandfather’s cousin Abu Ameen was a stonemason, uninterested in education, who lived for six months in the hills in a qasr – a round stone structure with a spiral staircase, where you sleep upstairs and keep the produce below. When I was a child I was told about Harrasha, a place that had a qasr where Abu Ameen had lived. I only ever knew him as a sick man; he had had a stroke and moved very slowly, so it was hard to associate him with any great activity. I don’t know how old he was, but to me as a child he seemed ancient. I was always hearing about Abu Ameen and Harrasha, and how my highly-educated grandfather Saleem – who had a doctorate from Cornell in psychology and was a judge – liked to make short visits to his cousin in the hills; so I grew up with this vision of these two men, one very educated and one not at all interested in books, spending time together in this remote area I had never visited. In Palestinian Walks you tell the family story about Abu Ameen and his wife building a qasr on their honeymoon. After their first day of work, it was so late that they decided to stay out in the hills overnight, and set about collecting berries and herbs for their meal. That has such a romantic, fairy-story resonance. And qasrs sound beautiful, something like the brochs we have in Scotland. Yes, I have noticed that. Even today, if you walk in areas of the West Bank unaffected by settlement, you find the hills dotted with these qasrs, standing exactly as they were made. They didn’t use any cement or alternative to cement, so all the stones support each other. People built them by piling up gravel and soil and placing the stones around the heap, then when they added the final keystone, the rubble was removed and the qasr structure remained. Then a spiral staircase would be built, sometimes on the inside, sometimes on the outside. In every area there was a slight variation in how they were built. In the Bethlehem area, the spiral staircase wraps around the outside and in Ramallah they are round, in some other areas, they are square. You enter by a narrow, low door, and there is a domed roof, and in some cases there are two floors and you take a spiral stair to the upper one. The top is open, so you could sleep in the open air and still be protected from wild animals. Not that there are many of those any more, but there used to be jackals. People kept their produce inside their qasr so that it would not dry in the sun. But this way of life was on the wane. Over the years, many Palestinians have left the country to find work abroad, mostly in the Gulf and the United States. As a result, most of these terraced hills, cultivated with olive trees, were abandoned, and no one planted the land any more. And for this reason, the hills became a beautiful, natural park that stretches as far as the eye could see. Why was it that you first took up hill-walking? I’m not quite sure. I first took it up in the late seventies. At that time, the only people I encountered in the hills around Ramallah were shepherds. Some of the paths I followed were marked on ordnance maps, but many were unmarked tracks that had been created by these shepherds and their sheep and goats. In part I was inspired to take up walking by my love of literature, particularly the romantic poets. I sometimes invited my human rights colleagues to walk with me and some have since become keen and committed walkers. 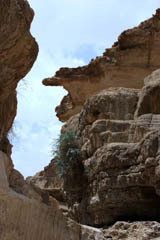 We would go for walks together, and sometimes we would run down the hillside into a Wadi; the hills are extremely rocky and covered with loose stones, and you have to be careful not to twist your ankle. So we would get down as fast as we could, watching every step, running and twisting and turning. Once down we would say, ‘Let’s race the sun,’ then run up the next hill as fast as we could before the sun set. It was extremely thrilling. Once the sun was down, we would have discussions about our work. At the same time as I was discovering the beauty of the hills, I was keenly aware that they were going to be lost, having learned of the Israeli plans to cut off West Bank villages and towns from one another and create blocks of settlements connected to Israel. I remember driving to Beit ‘Ur for the Albina case which I describe in the book, and trying to imagine what it was going to be like in the future. I thought: ‘What if they suddenly decide to cut us off? What will our future be if we are put into small enclaves?’ And I kept thinking, as we walked in the hills, that if the plans for the settlements were implemented, there would be Jewish children born and raised near Ramallah who would come to love the hills, and how could they not? We wouldn’t be able to say the Jewish settlers loved the hills any less than us, but we would not be able to tolerate them because they had taken the land. I could see that the problems we had had since 1948 were going to intensify. Although the book expresses a lot of anger about Israeli settlement of Palestinian Land, you never dehumanise or stereotype people and I found it inspiring, the way you discuss your feelings with such humanity and honesty, encompassing the contradictions of it all. I think being in the hills and in nature clears the mind – the silence allows you to hear yourself and your thoughts. That’s one of the things I love about the hills. In writing this book, I wanted to integrate thoughts, memories and stories evoked by the walks. I started seeing how the location in the West Bank agreed with the mood and the subject that I wanted to discuss. For example, around the Dead Sea is a very stark and dramatic area, and a walk there is associated with my realisation of the implications of the Oslo Accords, which I knew right away were a disaster. I had given so much for the human rights struggle and for the legal struggle and now I saw it being destroyed completely. Tell me something about how you embarked on your pioneering work as a human rights lawyer. When I came back from Europe I realised that the military government was making changes in the occupied territories involving the land and the law, and that there would be long-term consequences. Some people were resisting with armed struggle, but that was not my idea of resistance. With a few others, I started the first Palestinian human rights organisation, Al-Haq. At the time it was called Law in the Service of Man. I volunteered my services as a lawyer for about thirteen or fourteen years to the organisation; through time, our advocacy of human rights developed as a form of resistance. You collaborated with the Scottish playwright David Greig, didn’t you? When I started coming to Edinburgh I saw some of his plays and was very impressed and then we met through the Book Festival and became friends. He came to Ramallah for a short visit and worked with a local theatre company. When the Bulbul Stopped Singing was published in spring 2003 and I gave him a copy. He saw, as I did, that it could do very well adapted for the stage. The Traverse put on a very good production, which toured extensively, playing in both Tehran and New York. David Greig has said that the theatre doesn’t work on polemic and certainty, but on doubt and tension. Well, if one had absolute certainty I think that there would be no need to write, because writing is always a search. And through writing, you discover things. I have been keeping a diary since 1968 and it is a way of life, really. For Palestinian Walks, I went back to my diaries to check my descriptions of the walks I’d taken and to get a sense of the past. My diaries are an extremely important reference point. Of course, writing a book is not exactly like writing a diary. Palestinian Walks is about six journeys. The writing of the book itself was the seventh journey.